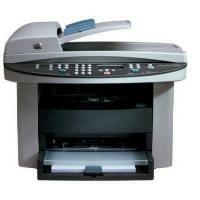 HP Laserjet 3030 printer is a multi-purpose product containing printer, scanner copier and fax machine. It feature laser-monochrome printing technology. The printer comes in a simple, compact design and weighs about 26.5 pounds. It measures around 14.9 (H) x 19.6 (W) x 15.7 (D) inches. With its flatbed design it can be fitted anywhere. It is suitable for small offices and home-office environment. HP Laserjet 3030 can print 14 pages per minute. The input tray can contain 150 sheets and output tray 125. The minimum sheet size for photocopying and printing is normal 3 inch by 5 inch and maximum size is 8.5 inch by 14 inch. In a monthly cycle HP Laserjet 3030 Toner Cartridges can print 7000 pages. Maximum printing resolution is up to 1200 x 1200 dpi and maximum optical resolution is 600 x 600 dpi. HP Laserjet 3030 is compatible with near about all operating system like Apple Mac OS (all version), Windows 2000 SP3 or later, Windows XP, including Tablet PC Edition. It features 240MHZ processor and comes with a standard and supported memory of 32 MB. It can be connected with a computer system through a network cable, USB 2.0, no wireless connectivity is available. HP Laserjet 3030 printer is a suitable machine for small work or business needs. With its multifunction quality, decent paper handling capacity, enough memory support it can be a good bet where printing work is not very voluminous. What to do if the pages printed are totally blank? Step1: Please check if your document contains any blank pages. In that case, delete all the blank pages from the document you are printing to see. Step 2: Make sure that the sealing tape on the HP Laserjet 3030 toner cartridge is removed and pulled out. If it is still there carefully remove the cartridges from the printer and remove all the packing material from it. Reinstall the cartridge and try printing the document again. Step 3: Check the currently selected settings of the device by printing the configuration page. Step 4: If you are making a copy, the document might be loaded incorrectly. The original must be loaded into the automatic document feeder with the print side facing up. If the original is loaded print-side down, the copy prints out blank. How to resolve the problem of missing or faded images? Step1: Check for the toner level in the HP Laserjet 3030 toner cartridges. If the cartridges are running low on toner then the output might be faded or faint. Step2: The quality of the original image also determines the quality of the image printout. If the image is from a web page or the quality of the image is low you will get a faded or dull printout. Step3: Please check if your printout has a coloured background. In that case, the image in the foreground will be faded or light. Step4: Please check if the cartridges are installed properly in their place. Q. What operating systems does the HP Laserjet 3030 printer support? A. HP Laserjet 3030 supports Windows OS, Mac OS, SAP, MS Dos and Linux OS. In Windows OS, it supports Windows Server 2003 and greater. In Mac OS, it supports Mac OS 9 and greater. Q. What could be the reason for my HP Laserjet 3030 printer giving light prints or fades during printing? The toner level is low. The media might not meet HP media specifications. The print density adjustment might be too light or EconoMode might be turned on. You need to adjust the print density and turn off EconoMode. Q. I recently ordered HP Laserjet 3030 Toner Cartridges from your website. In unexpected circumstances, I had to leave the city and missed the delivery. Are there any additional charges for rescheduling of delivery? A. All our orders are delivered by Fastway Couriers. They will try to make a maximum of two deliveries. If nobody is there to receive the order, the items will be returned to their central depot or to our warehouse. Any further delivery attempt will incur an additional charge of €4.95 inc VAT. Q. How much noise does the HP Laserjet 3030 printer generate during operation? A. This printer generates 56 dB noise during operation. A. oner cartridges are filled with powder that may include polymer, wax, carbon powder, resin, etc. Toner cartridges are used in laser printers while Ink cartridges are designed for inkjet printers and contains liquid ink. Toner cartridges are comparatively cheaper since they can print more pages relative to their cost and are better prepared to handle high volume print jobs. Q. Will I receive toner cartridges when I buy a HP Laserjet 3030 printer or do I have to purchase HP Laserjet 3030 toner cartridges separately? A. HP provides a set of HP Laserjet 3030 toner cartridges with the HP Laserjet 3030. You can buy more toner cartridges when the starter toner cartridges run out. You can find a range of HP Laserjet 3030 toner cartridges on our website. Q. Recently I scanned some printouts for my university assignment. But the images I received were too dark. I haven’t been able to solve this out. Could you please help? A. Sure. There are three main reasons for this problem. Firstly, the contrast is not adjusted properly. You can set the correct contrast and resolution settings from the HP Toolbox or the control panel menu. For more information, you can refer the printer’s user guide. Secondly, the output image may be dark if the original image is dark. Again, to resolve this issue you need to make contrast and resolution settings from the HP Toolbox or control panel menu. Lastly, if the original image is on a coloured paper, the image and text might not be clear (this also includes brown recycled paper). You can adjust the brightness, contrast, and resolution for the same from HP Toolbox. Q. I need HP Laserjet 3030 toner cartridges in bulk urgently. What should I do? A. For bulk inquiries please contact our customer support. They will help you in placing the order correctly. If you want an urgent delivery, you can even have a live chat with our team. Q. I need to replace the separation pad as my printer HP Laserjet 3030 is picking up more than one page. But I doubt can we do it without any technical guidance? A. Yes, you can replace the separation pad without any technical guidance. You can refer the step by step instructions from the user manual of HP Laserjet 3030 for detailed assistance. But, please do remember to clean the pickup roller before replacing the separation pad. Q. I am not sure whether HP Laserjet 3030 toner cartridges will fit in my printer or not. What should I do? A. Please enter your printer’s model name into the search bar and you will be presented with the toner cartridges that match your printer. For information on list of printers compatible with HP Laserjet 3030 toner cartridges please click on the link given below - https://printerinkcartridges.ie/2-pack-hp-q2612a-hp-toner-cartridge.